An article in the current issue of the feminist philosophy journal Hypatia has created such a controversy over the past several days that the members of its board of associate editors have now issued an apology for publishing it. 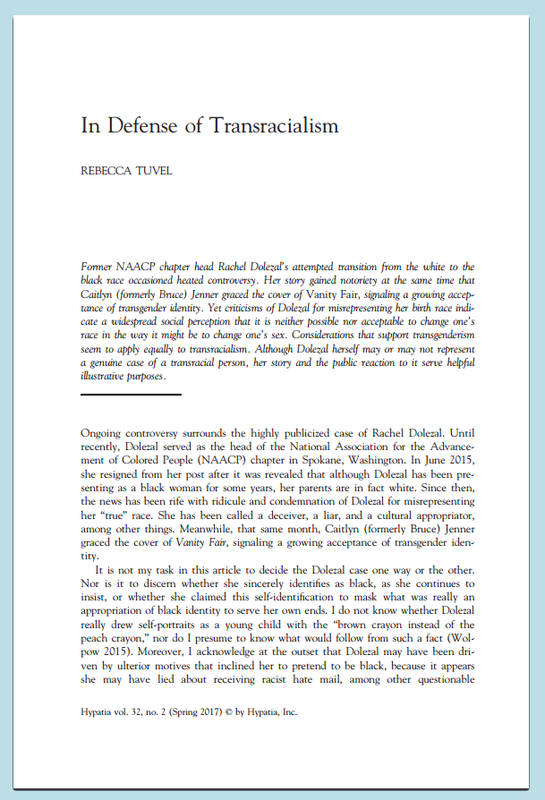 The article is “In Defense of Transracialism” by Rebecca Tuvel, an assistant professor of philosophy at Rhodes College in Memphis, Tennessee. In the paper, Professor Tuvel takes up the question of whether the considerations that support accepting transgender individuals’ decisions to change sexes, which she endorses, provide support for accepting transracial individuals’ decisions to change races. She defends an affirmative answer to that question. 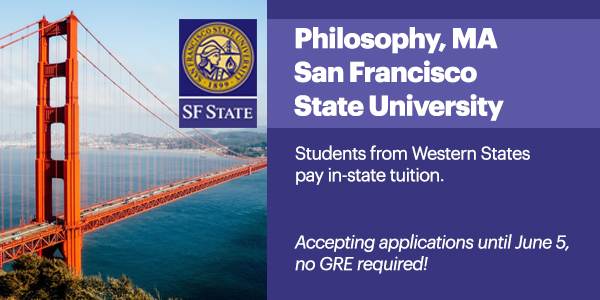 The result has been an eruption of complaints from a number of philosophers and other academics, expressed mainly on Facebook and Twitter. [See the update below for a response from Prof. Tuvel.] Among the complaints is the charge that the paper is anti-transgender. 4. It fails to seek out and sufficiently engage with scholarly work by those who are most vulnerable to the intersection of racial and gender oppressions (women of color) in its discussion of “transracialism”. We endorse Hypatia’s stated commitment to “actively reflect and engage the diversity within feminism, the diverse experiences and situations of women, and the diverse forms that gender takes around the globe,” and we find that this submission was published without being held to that commitment. Generally, we treat people wrongly when we block them from assuming the personal identity they wish to assume. For instance, if someone identifies so strongly with the Jewish community that she wishes to become a Jew, it is wrong to block her from taking conversion classes to do so. This example reveals there are at least two components to a successful identity transformation: (1) how a person self-identifies, and (2) whether a given society is willing to recognize an individual’s felt sense of identity by granting her membership in the desired group. For instance, if the rabbi thinks you are not seriously committed to Judaism, she can block you from attempted conversion. Still, the possibility of rejection reveals that, barring strong overriding considerations, transition to a different identity category is often accepted in our society. It is not clear how this is a mischaracterization. Nor is it “offhand” in any objectionable way. Charles Mills identifies at least five categories generally relevant to the determination of racial membership, including “self-awareness of ancestry, public awareness of ancestry, culture, experience, and self-identification” (Mills 1998, 50). If ancestry is a less emphasized feature in some places (for example, in Brazil), then Dolezal’s exposure to black culture, experience living as someone read as black, and her self-identification could be sufficient to deem she is black in those places. And because there is no fact of the matter about her “actual” race from a genetic standpoint, these features of Dolezal’s experience would be decisive for determining her race in that particular context. The crucial point here is that no “truth” about Dolezal’s “real” race would be violated. That leaves Point 1. I am not an expert in the relevant subfields, so I am not in much of a position to comment as to whether their conventions have been adhered to by Tuvel. Such conventions clearly embed some expert knowledge and communicative efficiency, yet there is a question here about the extent to which a failure to adhere to such conventions counts as an objection. It is difficult to imagine that this article could have been endorsed by referees working in critical race theory and trans theory, which are the two areas of specialization that should have been most relevant to the review process. A message has been sent, to authors and readers alike, that white cis scholars may engage in speculative discussion of these themes without broad and sustained engagement with those theorists whose lives are most directly affected by transphobia and racism. I contacted Hypatia to ask whether the paper had undergone their standard reviewing procedure, and the editors there stated that it had. The paper made it through double-anonymous review with at least two referees. Between the complaints on social media and the open letter, sufficient pressure has been put on Hypatia that members of its board of associate editors have already issued an apology for publishing Tuvel’s essay in which they state that “Clearly, the article should not have been published.” The speed with which this has all happened is extraordinary. We, the members of Hypatia’s Board of Associate Editors, extend our profound apology to our friends and colleagues in feminist philosophy, especially transfeminists, queer feminists, and feminists of color, for the harms that the publication of the article on transracialism has caused. The sources of those harms are multiple, and include: descriptions of trans lives that perpetuate harmful assumptions and (not coincidentally) ignore important scholarship by trans philosophers; the practice of deadnaming, in which a trans person’s name is accompanied by a reference to the name they were assigned at birth; the use of methodologies which take up important social and political phenomena in dehistoricized and decontextualized ways, thus neglecting to address and take seriously the ways in which those phenomena marginalize and commit acts of violence upon actual persons; and an insufficient engagement with the field of critical race theory. Perhaps most fundamentally, to compare ethically the lived experience of trans people (from a distinctly external perspective) primarily to a single example of a white person claiming to have adopted a black identity creates an equivalency that fails to recognize the history of racial appropriation, while also associating trans people with racial appropriation. We recognize and mourn that these harms will disproportionately fall upon those members of our community who continue to experience marginalization and discrimination due to racism and cisnormativity. It is our position that the harms that have ensued from the publication of this article could and should have been prevented by a more effective review process. We are deeply troubled by this and are taking this opportunity to seriously reconsider our review policies and practices. While nothing can change the fact that the article was published, we are dedicated to doing what we can to make things right. Clearly, the article should not have been published, and we believe that the fault for this lies in the review process. In addition to the harms listed above imposed upon trans people and people of color, publishing the article risked exposing its author to heated critique that was both predictable and justifiable. A better review process would have both anticipated the criticisms that quickly followed the publication, and required that revisions be made to improve the argument in light of those criticisms. The full statement is available here. You can click on the screenshots below to be taken to the publisher’s page for Tuvel’s article. I wrote this piece from a place of support for those with non-normative identities, and frustration about the ways individuals who inhabit them are so often excoriated, body-shamed, and silenced. When the case of Rachel Dolezal surfaced, I perceived a transphobic logic that lay at the heart of the constant attacks against her. 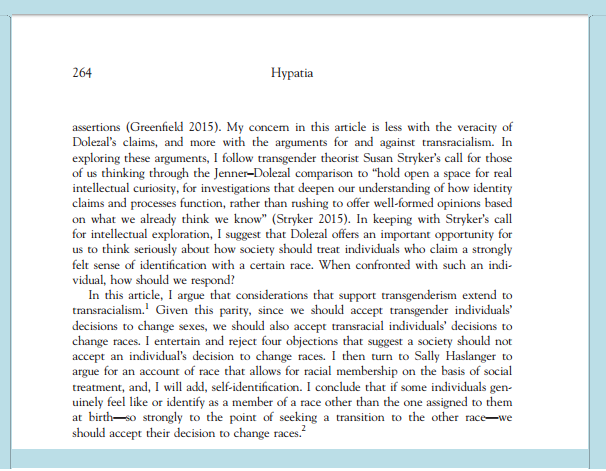 My article is an effort to extend our thinking alongside transgender theories to other non-normative possibilities. The vehement criticism has already raised a number of concerns. I regret the deadnaming of Caitlyn Jenner in the article, which means that I referred to her birth name instead of her chosen name. Even though she does this herself in her book, I understand that it is not for outsiders to do and that such a practice can perpetuate harm against transgender individuals, and I apologize. The deadnaming will be removed from the article. I also understand that some people are offended by my use of the term transgenderism. My motivation for using it came from a blogpost by Julia Serano, as I find her defense of the term persuasive. A valid reproach is that my article discusses the lives of vulnerable people without sufficiently citing their own first-person experiences and views. But so much wrath on electronic media has been expressed in the form of ad hominem attacks. I have received hate mail. I have been denounced a horrible person by people who have never met me. I have been warned that this is a project I should not have started and can only have questionable motivations for writing. Many people are now strongly urging me and the journal to retract the article and issue an apology. They have cautioned me that not doing so would be devastating for me personally, professionally, and morally. From the few who have expressed their support, much has been said to me about bullying culture, call-out culture, virtue-signaling, a mob mentality, and academic freedom. So little of what has been said, however, is based upon people actually reading what I wrote. There are theoretical and philosophical questions that I raise that merit our reflection. Not doing so can only reinforce gender and racial essentialism. I deeply worry about the claim that the project itself is harmful to trans people and people of color. These are, of course, wide and varied groups, some of whom experience offense and harm at the idea of transracialism, and others who do not. People of color and trans individuals are not of one mind about this topic, of course, and online publications attest to this. For instance, Kai M. Green has defended the importance of grappling with the question of transracialism. Adolph Reed Jr., Camille Gear Rich, Melissa Harris Perry, Allyson Hobbs, Angela Jones, Ann Morton, BP Morton, among others, have also expressed more sympathetic positions on the topic. The philosophical stakes of this discussion merit our consideration. “The reason that two anonymous blind reviewers recommended publication of Tuvel’s paper is because it is a tightly written, well argued philosophical defense of a novel thesis that merits serious philosophical consideration.” — Mylan Engel (Northern Illinois) in a public Facebook post. “It looks to me like defamation per se.” — Brian Leiter (Chicago) at Leiter Reports. “A tentative response to some elements in her piece from the perspective of a fellow-traveler in Millian philosophy.” — Eric Schliesser (Amsterdam) at Digressions & Impressions. “It is time for those of us who are tenured to stop allowing a very junior and vulnerable feminist scholar to be subjected to this treatment without any public support from the feminist community.” — Chloe Taylor (Alberta) in the comments, below. “Stop symbolically conscripting Rebecca Tuvel into the role of personifying all of these systemic issues that attach to the profession at large.” — Prof Manners at Feminist Philosophers. “I am bothered by the self-righteousness of philosophers and others who speak from positions of relative privilege—white and/or cis and/or masculine and/or tenured—acting as if they’re so woke that they would never make the kinds of mistakes they’ve charged to Tuvel.” — Jason Wyckoff at his blog. “Although there have been many contributions on both sides of the discussion that have made it clear that Prof. Tuvel is not to blame, individually, for the crisis, some have unfairly targeted her and do not look to the bigger picture. Let us now focus on why this spark led to the fire, rather than the spark.” — Sally Haslanger (MIT) here. In “The School of Athens,” Raphael “disguised Hypatia in the likeness of the Pope’s favorite nephew, hoping in this way to gain approval of the painting. By altering her to resemble the nephew’s juvenile features, he rendered her in a way that she could pass as male, but this also required replacing her darker features with pale ones. We need to understand more of our own history in order to make a different and better future.” — Linda Alcoff (Hunter/CUNY) in a public Facebook post. 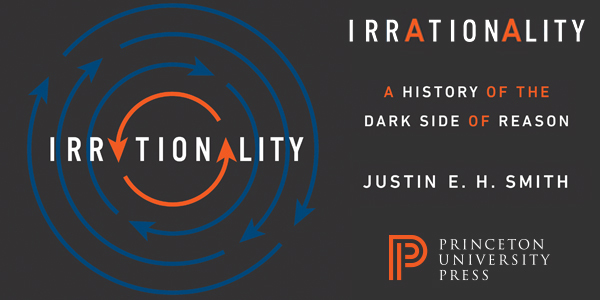 “I’ve heard a version of this criticism made many times by philosophers with activist commitments: we shouldn’t argue for such and so, even if it’s true, because of the possible political consequences of arguing for such and so. I’ve always found these kinds of worries to be exaggerated…” — Holly Lawford Smith (Melbourne) at Crooked Timber. “If those of us on the left are unable to make distinctions between legitimate intellectual disagreements and damaging lies, we will be hoist with our own petard.” — Suzanna Danuta Walters (Northeastern) in The Chronicle of Higher Education. Some academics “supported Tuvel in private while actually attacking her in public… [while others] were pressuring, even threatening, Tuvel that she wouldn’t get tenure and her career would be ruined if she didn’t retract her article.” — Kelly Oliver (Vanderbilt) in The Philosophical Salon at the Los Angeles Review of Books. Also of interest: “An Inclusive Bibliography on Race, Gender, and Related Topics” — a Google Doc.